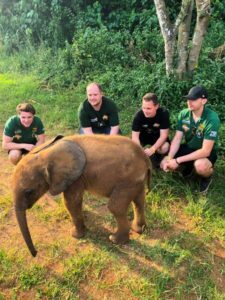 In an exclusive interview for Discover Animals, Paradise Wildlife Park’s Aaron Whitnall tells us about his recent Drive 4 Wildlife mission to East Africa with brothers Tyler Whitnall, Cameron Whitnall and family friend Redmond Bolton. The remarkable African safari and animal conservation project took the team trekking across four countries to deliver vital equipment and funds to wildlife charities. Having grown up surrounded by wildlife all four are passionate about the conservation of African species and work together at the Park. 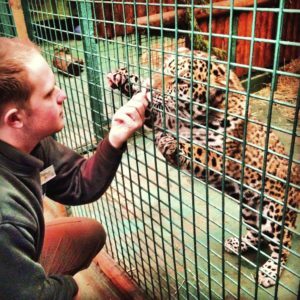 The brothers’ grandfather is Peter Sampson, founder of Paradise Wildlife Park and sister organisations, the Zoological Society of Hertfordshire and the Big Cat Sanctuary in Kent. 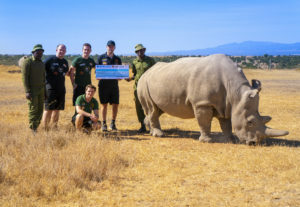 The Drive 4 Wildlife team are now spearheading another fundraising initiative to buy and fit out of a specialist vehicle that will be used to rescue injured animals and help aid anti-poaching patrols. Congratulations on your recent Drive 4 Wildlife mission to East Africa. What inspired you to take on this challenge? Thank you very much! Having grown up in the ‘wildlife profession’, we have always wanted to try to do as much as possible to support wildlife conservation around the world. So, when we won the funding from the Motor Vision Awards* for an expedition, we agreed Africa would be the perfect destination. It’s the most famous wilderness on the planet and home to the world’s iconic animals. At the same time, it is arguably facing the greatest challenges from the illegal wildlife trade, and so we decided we should show what’s happening but also what’s being done to help protect wildlife. The Paradise Wildlife Park team visited four countries in four weeks while on this mission. Can you tell us about the charities you donated funds & equipment to and how this will make a difference? Yes, we visited Tanzania, Rwanda, Uganda and Kenya whilst on the expedition. The main charities we worked with for Drive 4 Wildlife were the African Wildlife Foundation, Ol Pejeta and the Ugandan Wildlife Education Conservation Centre. We visited two African Wildlife Foundation projects in Tanzania called Canines 4 Conservation and the other being Manyara Ranch. On behalf of the Zoological Society of Hertfordshire & the Big Cat Sanctuary, we made donations of £5,000 to each project. This money will be used to build new kennels for the dogs at Canines for Conservation and go towards helping ensure the anti-poaching rangers at Manyara Ranch have sufficient equipment for protecting the wildlife living in the area. We also left donations of toys for the dogs at Canines 4 Conservation and fun items like footballs for the anti-poaching rangers at Manyara Ranch. At Ol Pejeta, we also donated £5,000, adding to the £30,000 we have given the conservancy since 2017, and a quantity of lion radio collars we donated last year. These funds and radio collars ensure their anti-poaching units have the right equipment for their work, so they can also track the lions and keep them apart from local communities – preventing the possibility of human and wildlife conflict. At the Ugandan Wildlife Education Conservation Centre, we donated £3,000 which will go towards the upkeep of the lions we sent to the centre a decade ago. We send this donation every year and it covers all food, husbandry and vet costs for the lions for the year. 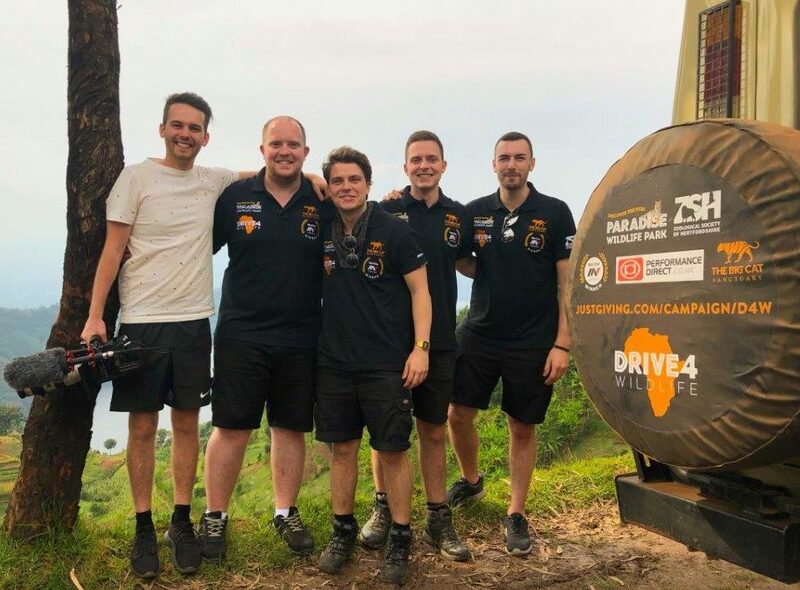 Our main aim now is to raise £25,000 to send a fully specified anti-poaching rescue and rehabilitation vehicle to Uganda for the team to use for their conservation efforts. Was the trip as you expected or did you find yourself faced with any challenges? In all honesty, the trip was better than we could ever imagine. Every charity gave us access to be able to experience everything first hand and also to capture anything we wanted on camera. The only difficulties we faced were crossing the borders, as some borders were really strict ­– so we did spend as long as four hours waiting for all of our equipment and passports to clear the checking process. But then, on the flip side, other borders where very quick and we were through them within just half an hour. Overall, the biggest difficulty was dealing with how long we were on the road and how little sleep we had at times. One part of the expedition saw us travel 14 hours one day, rest for five hours, then drive 17 hours, then rest again for five hours and then get back on the road for eight hours! So, at times, travelling did really take it out of us! Illegal hunting poses a serious threat to all endangered wildlife. Which species are you particularly worried for right now? It is certainly one of the threats to wildlife, but in each country, we found a different principle threat. These were poaching, human and wildlife conflict, the bushmeat trade and habitat destruction. The three animals I was most worried about coming away from Africa were lions, rhinos and pangolins. Most people seem to know about the threat facing rhinos because of their horns, but pangolins are the now the world’s most trafficked animals, and lions have seen the greatest population decline in the past twenty years, dropping 42% to less than 20,000 today. This is due to the medicine trade in Asia where they believe lion and tiger parts can help cure illnesses such as cancer as well as because of hunting (as you mentioned in your question). Having first-hand experience of wildlife in their natural habitat must be awe-inspiring. Did you have any memorable encounters while on this particular trip? The two experiences that really stand out for me were trekking the mountain gorillas in Bwindi Rainforest in Uganda and watching elephants swimming at Manyara Ranch in Tanzania. Gorillas are one of my favourite animals, so having the opportunity to get so close was such a special moment, especially as their numbers are actually now increasing for the first time in recent history! The elephants were a complete surprise – they weren’t used to seeing as many people as the gorillas, so being able to observe them playing and splashing about in the lake was truly awesome, and they didn’t take any notice of us! You are now spearheading a project to raise funds for an anti-poaching vehicle to be sent to Uganda. Can you tell us more about this project? Yes, this is the big aim for this expedition overall! After spending time at Queen Elizabeth National Park and seeing the struggles the team on the ground have getting around, it’s imperative we get them a vehicle to help with their efforts. At the moment, all they have are moped-like motorcycles that are old and break down regularly – this is something we witnessed while we were there, even when they are in the middle of the park with dangerous animals like lions around! If they come across an animal in trouble or need of rescue they have to wait, sometimes hours for support from proper vehicles to come and take the animals to vets or to safety at sanctuaries like the Ugandan Wildlife Education Conservation centre. So, by being able to provide them with a vehicle we can allow them to work much quicker and save more lives. We are now just in the process of sorting and editing our Drive 4 Wildlife trip footage, talking to broadcasters about the avenues we can explore with it and then we will really be able to start fundraising properly. Of course, alongside our friends at the Motor Vision Awards we are looking for sponsors to help with the vehicle and we can certainly promise a great deal of goodwill and news around the project. What can we do here in the UK to help protect endangered animals and what are your hopes for the future? I think the best thing we can do is learn to co-exist better and take better care of the environments we are living in. Take foxes, for example; most foxes are now urban and used to living around humans. They won’t harm anyone, so we should embrace actually being able to see our wildlife, instead of prosecuting and hunting them. Pollution and littering are other challenges for our wildlife, or ourselves, so better recycling schemes need to be established and people need to make more of an effort to recycle and prevent the pollution of wild habitats. Moving forward, our aim is to continue developing our conservation partnerships and establish new ones in other parts of the world. 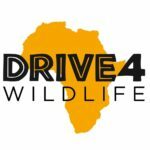 Our hope is to make Drive 4 Wildlife an annual campaign that will be used to show the threats facing animals in various parts of the world, but also to show the incredible wildlife conservation work taking place the world over. 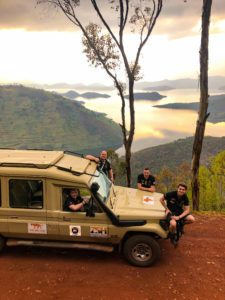 *The Drive4Wildlife expedition was funded by the Motor-Vision Award – a unique scheme that offers cash sponsorship of up to £20,000 to people who want to do inspiring things on wheels.